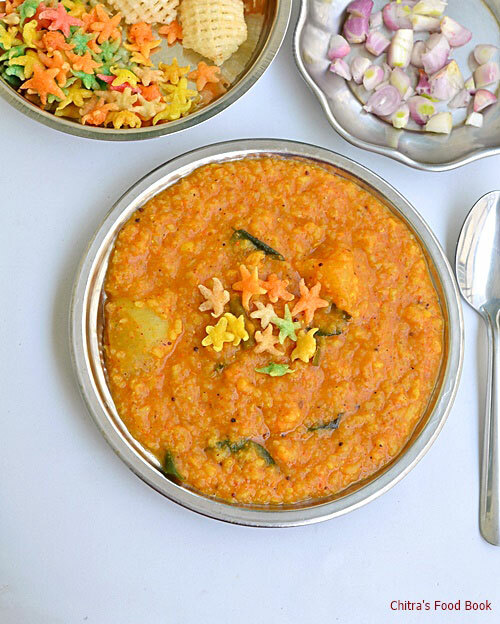 Take rice,dal,chopped vegetables,salt,turmeric powder,2 drops of oil and 6 cups of water. Cook it for one whistle in very low flame.Remove the lid and mash the rice,dal mixture very well.Add 1 cup of water to it and set aside. Now take the bisi bele bath powder,grated coconut and soaked tamarind along with little water in a mixie jar. Grind it to a smooth paste. Take the ground paste,add 2 cups of water and some salt to it. Mix well and boil the mixture in a kadai.Add some jaggery.Let the mixture roll boil for 5 minutes.You will get a nice smell. Now add the masala to the rice+dal mixture. Mix well and add 1 more cup of water.Check for taste and add more salt & bisi bele bath powder if needed. Let it boil nicely for 2-3 minutes. Lastly add 1 tbsp of ghee.Mix well.Adjust the consistency of rice by adding more water.It should be pourable.So add more water based on that and check for salt.Temper mustard,curry leaves, roasted peanuts and hing in a kadai and add to the rice.Mix well and serve hot !! Yummy,hot bisi bele bath is ready.Serve with kara boondi or raw onions as I did ! 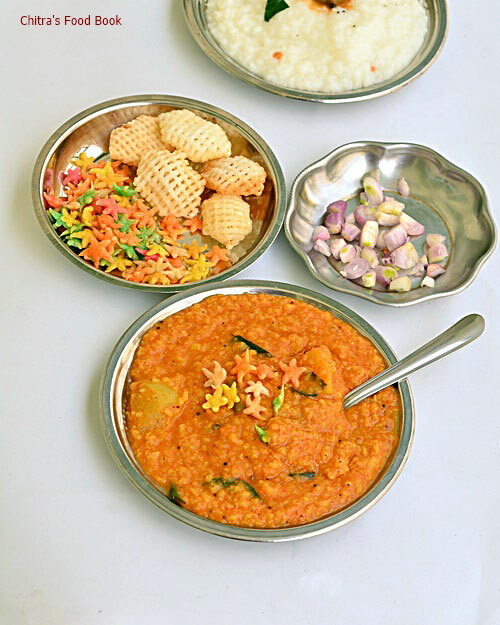 Add more bisi bele bath powder based on the spice level. You can add more jaggery if you like sweet taste. 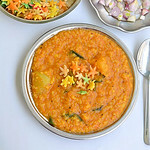 No need to use carrot or raddish .But you can use peas,chow chow/chayote if u wish.Skip Kholrabi if u don’t like it. Addition of ghee at the end gives a great taste.So don’t skip it. 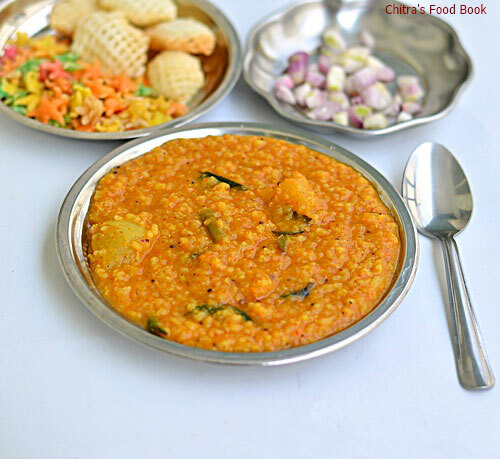 Enjoy eating hot,hot bisi bele bath with kara boondi or Raw onions.Tastes great !! that is so flavorful and aromatic!!! Its one of my favorites.. Very tempting. 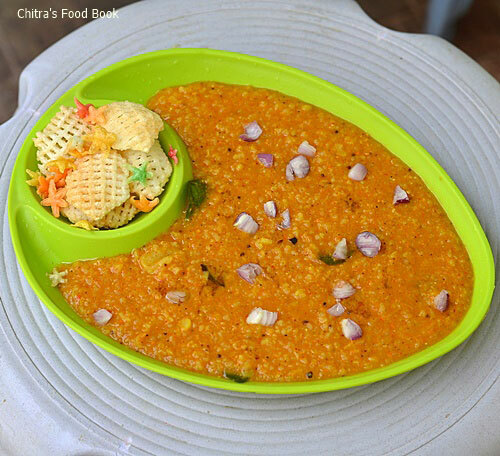 Bisi bele bath looks so delicious and tempting.. Nice pics too..
Nice post using less quantity and variety of vegetables. Wondering how you got the grainy (rava) consistency when I see the Bath so evenly mashed.Tempted to make and taste this version without onion and tomato. Thanks for sharing and taking us to MTR restaurant through your pictures. Thank u so much for your sweet words :) Its the quantity of water that matters here.Please try this recipe and leave your feedback here.I will be more happy. Am going to do make this recipe today. Thanks a lot for the link :) Happy to know ! Do try this recipe and enjoy :) Thank you! 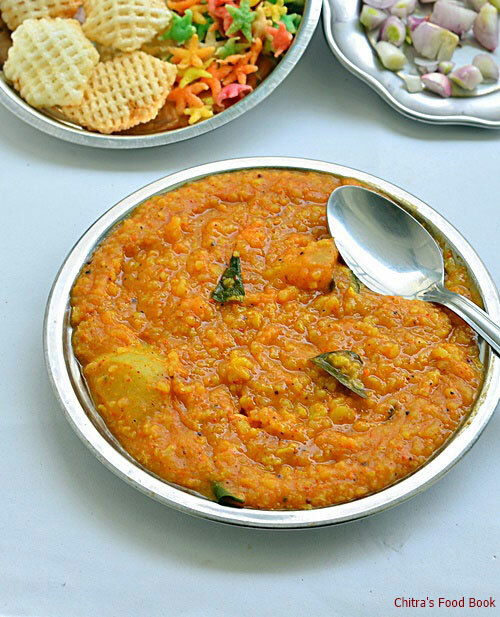 Do we need to soak the toor dal before pressure cooking? As We are adding more water to cook, you don't have to soak the dal.Please use drinking water to cook and not the hard water. Thanks a lot for this positive feedback :) I am very happy to know it !